There’s nothing better than sitting back and supporting your favorite sports teams on the weekend. All season, the UT Martin Basketball teams have been giving their best effort against their opponents. 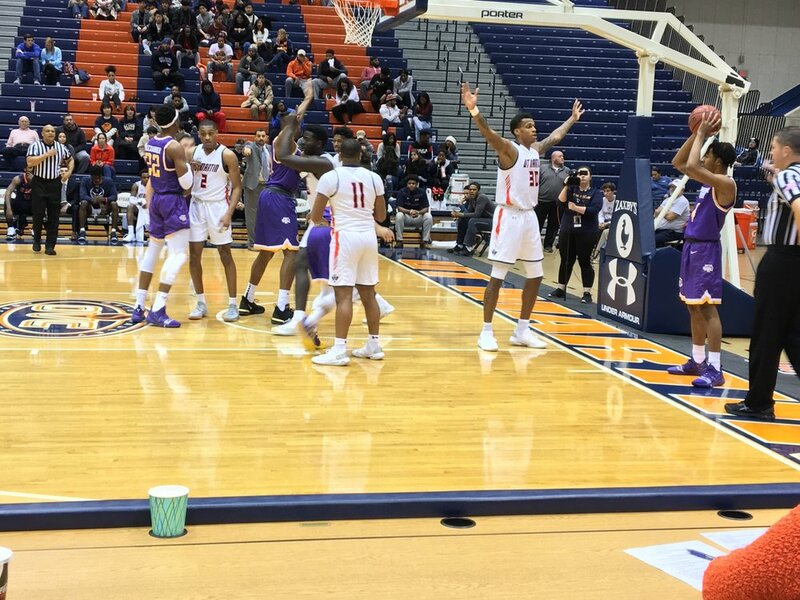 Yesterday afternoon, people gathered at the Tom and Kathleen Elam Center to attend the University of Tennessee women’s and men’s basketball games and observed as they took on the Tennessee Tech Eagles (TTU). 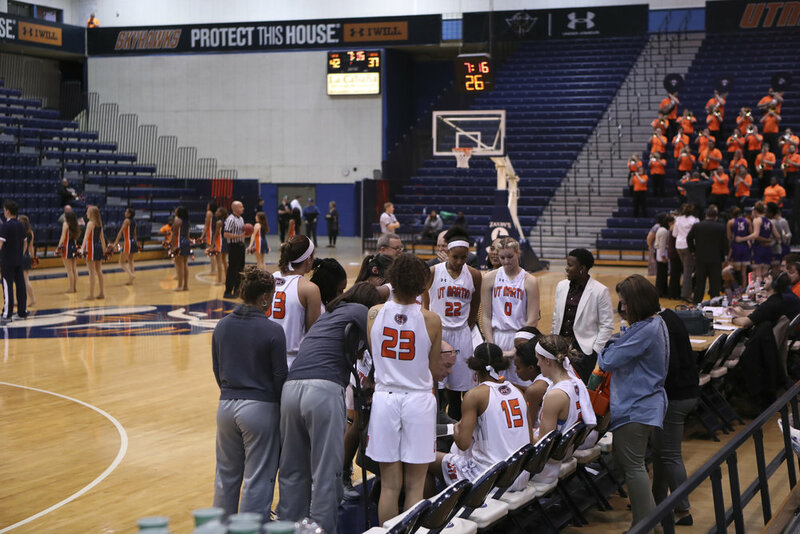 At 1 pm, the women’s team tipped off, expecting to continue their 11-game winning streak, on their home court. The Skyhawks unfortunately fell short this weekend, losing 80-76. The girls played a tough game, but Tennessee Tech led in most of the stats. The Skyhawks came out strong, in the first half, grinding to stay in the game, keeping the score close. They were even able to tie the game back up twice, in the second half. The crowd continued to cheer them on as they fought to the finish, but it wasn’t enough to pull the Skyhawks to the top. This upset leaves the Skyhawks record 8-4, in the Ohio Valley Conference (OVC), as they head into their next game, against our rivals across the Mississippi, Southeast Missouri (SEMO). Valiant efforts were made by key players Chelsey Perry, Maddie Waldrop, and Emanye Robertson. Chelsey Perry led the team in points yesterday, scoring a career-high 28 points! Both Robertson and Waldrop had double-doubles. Waldrop dropped an impressive 16 points and eight rebounds, and Robertson put up ten points and contributed an essential 13 assists! Following the girl’s game, the men stepped to the challenge and defeated TTU by an outstanding 19 points. After the nail-biting win over the Jacksonville State Gamecocks, who are now the number 2 team in the conference, the men’s team kept that same energy, as they tipped off the ball yesterday afternoon. From start to finish, the team played with enthusiasm and pride, only having seven available players. They didn’t let a lack of numbers slow them down as they led both halves in overall points. Quintin Dove had his first career double-double, and led the team in points, scoring 24! Next leading scorer, is the new but skillful addition, to the team, Craig Randall ll. The mid-year transfer joined just this year but is already showing what he can offer by putting up 17 points yesterday. The UT Martin defense was also a driving force behind this awesome win! The Skyhawks limited the Eagles’ team stats’ percentages to lower than 50 percent. Having a pretty decent crowd at the TTU game, there’s always room for more fans! Come out and cheer the Skyhawks on when they go up against SEMO, on Thursday, Feb. 14. The women’s game will begin at 5:30 p.m. and the men’s game will follow at 7:30 p.m. Be sure to show up and not only support the Skyhawks, but also wear pink to the women’s game, for their honorable “Play 4 Kay” Pink Out Game!